Deride the NRA's spokesman all you want, but his group is close to gutting gun control legislation in Congress. 60 percent, and more than 90 percent supported universal background checks for gun purchases. President Obama forcefully urged federal action, laying out a comprehensive gun control plan; he mobilized Organizing for Action, the nonprofit that grew out of his re-election campaign, to push for it. The rhetorical high point of his State of the Union address was a sonorous call for a timely vote on such a bill, because the victims of gun violence surely deserved at least that. Perhaps most promising, in what was taken as a sign of political disarray and ineptitude, the NRA’s main strategy seemed to be to put spokesman Wayne LaPierre on TV as often as possible so that he could elucidate his Bizarro World theory that the solution to gun violence is more guns, especially in schools—a message that repulsed even the organization’s Republican allies. But three months later, it’s not the NRA and Wayne LaPierre who appear most inept or bizarre. It’s Congress. The Senate is set to take up gun control legislation when it comes back from recess on April 8, but we already know that a ban on assault weapons and high-capacity magazines is off the table. According to majority leader Harry Reid, the ban, championed by California’s Dianne Feinstein, couldn’t even garner forty votes in the Senate, far below the sixty it would require to break an anticipated GOP filibuster. This means that at least thirteen Senate Democrats, including perhaps Reid, think it’s perfectly acceptable to put weapons like the Bushmaster semiautomatic rifle—the one Adam Lanza used to slaughter a classroom full of first graders—into the hands of virtually anyone who has $700 to spare. The faintest of silver linings is that Senator Feinstein plans to introduce the ban as an amendment, so at least we’ll know which Democrats (and Republicans) lack even the rudimentary common sense or the backbone to support such a measure. Meanwhile, the prospects for universal background checks are wobbly. Should the legislation garner the filibuster-proof majority required to pass the Senate, it would still have to pass the GOP-controlled House, where Speaker John Boehner may not even put it up for a vote. And even if he were pressured to do so, all the House Democrats and at least seventeen Republicans would have to vote for the bill, a daunting if not impossible bar. But would the system of background checks that survives this gantlet have any teeth left? Not if the NRA has anything to say about it. As is now clear, the group’s strategy has been far cannier than LaPierre’s rantings have let on. Initially, in order to avoid an overwhelming public backlash, the NRA indicated that it was open to background checks, as did many Republicans in Congress. But behind the scenes, the organization has been orchestrating a two-pronged attack, telling moderates that background checks would be ineffective against criminals while rallying the right wing against background checks that would require private gun sellers to keep records. 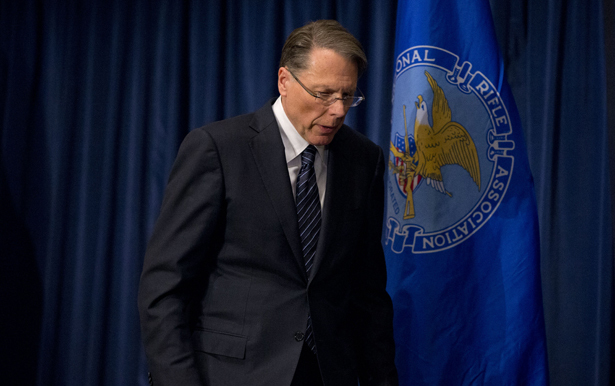 The NRA claims that such record-keeping is a precursor to a federal registry of gun owners. It’s not. But the idea has inflamed the already feverish right-wing paranoid fantasy that Obama is coming to get their guns. Without such record-keeping, background checks are meaningless and unenforceable. The problem here extends beyond the NRA’s lobbying muscle—it’s the structure of Congress itself. The exploitation of the filibuster in the Senate creates an unreasonably high bar to passing legislation that a majority of Americans support. Meanwhile, the extreme gerrymandering of House districts has produced a class of Republican lawmakers who can afford to utterly disregard national consensus so long as they cater to their reactionary base. In recent months, states like New York and Colorado have stepped up with strong gun control legislation, and mayors like New York’s Michael Bloomberg are rallying public opinion around a comprehensive federal bill. In Washington, though, inertia reigns. Since Sandy Hook, almost 3,000 people have died of gun violence in America. President Obama was right to say that these victims deserve a vote on gun control legislation. But they deserve much more than that. They deserve a Congress that works. Minority Leader Mitch McConnell has been the target of tough new ads in his home state on gun control, reports George Zornick. And here’s the latest.